Aluminium (UK i /ˌæljʉˈmɪniəm/ AL-ew-MIN-ee-əm) or aluminum (US i /əˈljuːmɪnəm/ ə-LEW-mi-nəm) is a silvery white member of the boron group of chemical elements. It has the symbol Al and its atomic number is 13. It is not soluble in water under normal circumstances. Aluminium is the most abundant metal in the Earth's crust, and the third most abundant element, after oxygen and silicon. It makes up about 8% by weight of the Earth's solid surface. Aluminium is too reactive chemically to occur in nature as a free metal. Instead, it is found combined in over 270 different minerals. The chief source of aluminium is bauxite ore. Despite its prevalence in the environment, aluminium salts are not known to be used by any form of life. Also in keeping with the element's abundance, it is well tolerated by plants in soils (in which it is a major component), and to a lesser extent, by animals as a component of plant materials in the diet (which often contain traces of dust and soil). Soluble aluminium salts have some demonstrated toxicity to animals if delivered in quantity by unnatural routes, such as injection. Controversy still exists about aluminium's possible long-term toxicity to humans from larger ingested amounts. In comparison, bronze is principally an alloy of copper and tin. Bronze does not necessarily contain tin, and a variety of alloys of copper, including alloys with arsenic, phosphorus, aluminum, manganese, and silicon, are commonly termed "bronze". The term is applied to a variety of brasses and the distinction is largely historical. Bronze is a metal alloy consisting primarily of copper, usually with tin as the main additive. It is hard and brittle, and it was particularly significant in antiquity, so much so that the Bronze Age was named after the metal. However, since "bronze" is a somewhat imprecise term, and historical pieces have variable compositions, in particular with an unclear boundary with brass, modern museum and scholarly descriptions of older objects increasingly use the more cautious and inclusive term "copper alloy" instead. There are many different bronze alloys but modern bronze is typically 88% copper and 12% tin. Alpha bronze consists of the alpha solid solution of tin in copper. Alpha bronze alloys of 4–5% tin are used to make coins, springs, turbines and blades. Historical "bronzes" are highly variable in composition, as most metalworkers probably used whatever scrap was to hand; the metal of the 12th century English Gloucester Candlestick is bronze containing a mixture of copper, zinc, tin, lead, nickel, iron, antimony, arsenic with an unusually large amount of silver - between 22.5% in the base and 5.76% in the pan below the candle. The proportions of this mixture may suggest that the candlestick was made from a hoard of old coins. The Benin Bronzes are really brass, and the Romanesque Baptismal font at St Bartholomew's Church, Liège is described as both bronze and brass. Bismuth bronze is a bronze alloy with a composition of 52% copper, 30% nickel, 12% zinc, 5% lead, 1% bismuth. It is able to hold a good polish and so is sometimes used in light reflectors and mirrors. 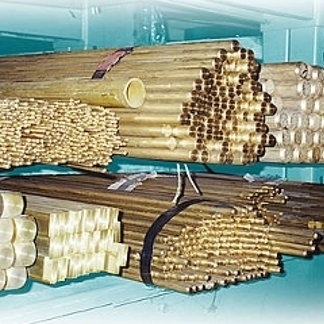 Other bronze alloys include aluminum bronze, phosphor bronze, manganese bronze, bell metal, arsenical bronze, speculum metal and cymbal alloys.